Because the Arduino (and Basic Stamp) are 5V devices, and most modern sensors, displays, flash cards and modes are 3.3V-only, many makers find that they need to perform level shifting/conversion to protect the 3.3V device from 5V. We do have some other handy level shifters in the shop, from the DIP 74LVC245 to the fancy bi-directional TXB0108. However, neither of these are happy to work with I2C, which uses a funky pull-up system to transfer data back and forth. This level shifter board combines the ease-of-use of the bi-directional TXB0108 with an I2C-compatible FET design following NXP's app note. This breakout has 4 BSS138 FETs with 10K pullups. It works down to 1.8V on the low side, and up to 10V on the high side. The 10K's do make the interface a little more sluggish than using a TXB0108 or 74LVC245 so we suggest checking those out if you need high-speed transfer. 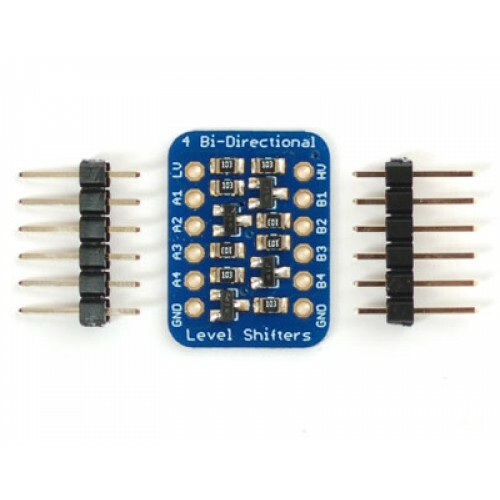 While we designed it for use with I2C, this works great for SPI, TTL Serial, and any other digital interface both uni-directional and bidirectional. 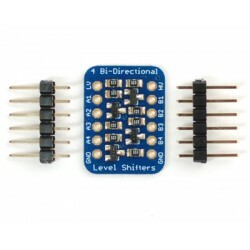 Comes with a fully assembled, and tested PCB with 4 full bidirectional converter lines as well as 2 pieces of 6-pin header you can solder on to plug into a breadboard or perfboard.